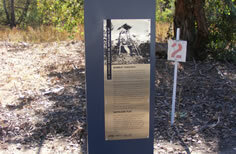 Your tour begins at the interpretive signage near the general store at the centre of the town and follows a dirt road (it is suitable for 2 wheel as well as 4 wheel drive cars) through the Woolshed Valley to Beechworth. Commence a journey of history and adventure with the homes of Joe Byrne and Aaron Sherritt, Ned Kelly stories and ghost towns of the mining era. The Woolshed Valley, believed to be one of Victoria’s oldest because of its geological features, begins here in El Dorado and ends near the historic town of Beechworth.